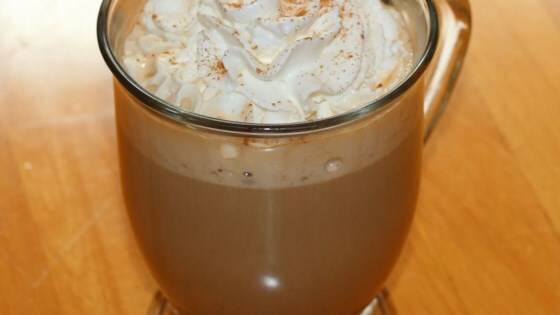 "This is a warm and creamy rich pumpkin drink that taste like a Starbucks® pumpkin latte, but with NO caffeine. It is very kid-friendly or great at the midday office holiday party." Combine pumpkin, milk, sugar, cinnamon, and vanilla in a large saucepan over medium heat. Use a whisk to blend well. Heat to a simmer; do not boil. My kids and I loved this. Loved. I will admit, I did add coffee to mine, but the kids drank theirs as is and asked for the rest of what was left in the saucepan. A+ drink. These are surprisingly good! Straining them might help with the chunkiness at the bottom.